Thermo Fisher Scientific has agreed to acquire Brammer Bio for $1.7 billion cash, the companies said, in a deal designed to increase the buyer’s presence in gene therapy with the viral vector contract development and manufacturing organization (CDMO). 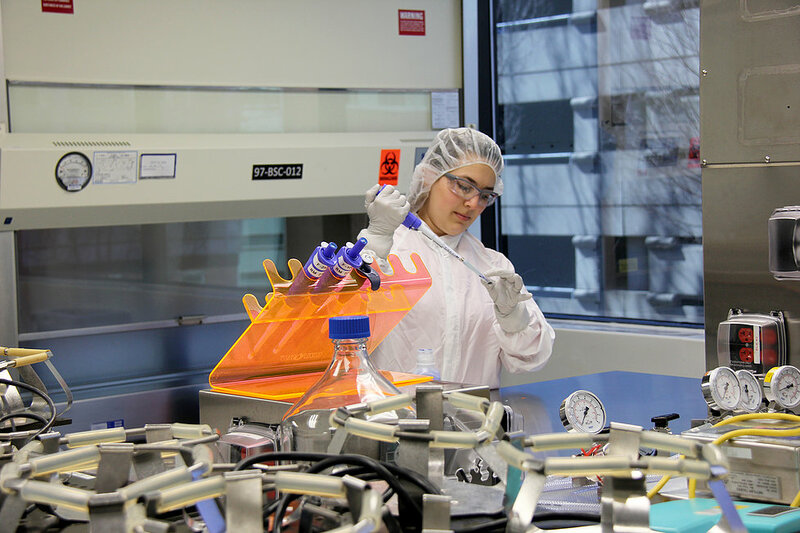 Headquartered in Cambridge, MA, Brammer Bio employs nearly 600 people at primary locations in Massachusetts and Florida. Brammer Bio is projected to generate $250 million in revenue this year, and expects to continue to exceed the projected market growth rate of 25% over the mid-term, according to the companies. An 80,000-square-foot early clinical campus in Alachua, FL, consisting of three buildings: a process development and analytical development facility, adjacent to its CGMP Phase I/II clinical manufacturing operation with a third warehouse and office building. Brammer Bio says its CGMP facility is designed to accommodate spatially segregated viral vector processing in dedicated production suites to support early phase clinical trials. This year, Brammer is expected to have operational an additional 50,000-square-foot Lexington, MA facility that includes commercial ready Grade B clean rooms for viral vector manufacturing. “The combination of Brammer Bio’s viral vector capabilities with our GMP production expertise and proprietary bioprocessing and cell culture technologies uniquely positions us to partner with our customers to drive the evolution of this incredibly fast-growing market,” Thermo Fisher president and CEO Marc N. Casper said yesterday in a statement. Thermo Fisher senior vice president and COO Mark Stevenson told GEN in a tweet that the acquisition will help the company address the longtime challenge of producing viral vectors at required scale, a challenge discussed last week at a panel talk during the Alliance for Regenerative Medicine’s Cell and Gene Therapy Investor Day. The acquisition is expected to be completed by the end of the second quarter, subject to customary closing conditions that include regulatory approvals. Upon completion of the deal, Brammer Bio will become part of Thermo Fisher’s pharma services business within its Laboratory Products and Services segment. That segment finished 2018 with revenue of $10.04 billion, a 28% jump from $7.83 billion in 2017, and an adjusted operating margin of 12.5%, versus 12.8% in 2017. Thermo Fisher does not report results for Pharma Services or other businesses within Laboratory Products and Services. Until now, Pharma Services consisted solely of the legacy business of Patheon, which Thermo Fisher acquired in 2017 for $7.2 billion in a deal that expanded the buyer into the CDMO market. Discussing Q4 and full-year 2018 results with analysts on the company’s quarterly conference call, senior vice president and CFO Stephen Williamson said the Patheon business “grew just about 10% for the year,” up from the mid-single-digits when Thermo Fisher bought the company, according to a transcript published by Seeking Alpha. Williamson noted Thermo Fisher was expanding Pharma services operations. The company is underway with a $50 million expansion announced last year of its Center of Excellence (COE) for Biological Commercial Manufacturing site in St. Louis. And on March 18, Thermo Fisher disclosed plans for a $150 million expansion of capacity for sterile liquid and lyophilized product development and commercial manufacturing at sites in Monza and Ferentino, Italy, and Greenville, NC. Each site will be equipped with aseptic filling lines and isolator technology. Pharma Services led all units within Laboratory Products and Services in generating 8% year-over-year revenue growth, to $2.60 billion, during the fourth quarter of 2018. Pharma Services is Thermo Fisher’s business unit created to provide the entire spectrum of development, manufacturing, and clinical trials services for both small-molecule and large-molecule pharmaceuticals. Those services include development of a suitable formulation and manufacturing process for the active pharmaceutical ingredient (API) or biologic; technology transfer to scale up the manufacturing; labeling, packaging, distribution, and logistics for clinical trials; and commercial-scale manufacturing and packaging. In its form 10-K annual report for 2018, Thermo Fisher valued Pharma Services at $3.37 billion of “goodwill,” an intangible asset associated with the purchase of a company. Pharma Services had an overall “carrying value” of $7.70 billion as of December 31, 2018, defined as the original cost of an asset, less the accumulated amount of any depreciation or amortization, less the accumulated amount of any asset impairments. Thermo Fisher said it expects Brammer Bio to add to its adjusted earnings per share by $0.10 in the first full year of ownership. Thermo Fisher finished last year with adjusted earnings per share of $11.12, up 17% from $9.49 in 2017. For 2019, the company has offered guidance to investors that adjusted EPS is set to rise this year to between $12 and $12.20, an increase of 8% to 10% growth over 2018.